these simple Native American Style beaters are hand crafted from locally gathered wood. the drum heads are padded with cotton batting, the leather is deerskin of various colors and types. All have been Beat tested at several timed during construction. I really love your drum beaters. How do I go about purchasing one of these for a very large Taos Drum that I have? I am thinking a 13 inch one and comfortable to hold while doing a lot of drumming on this large floor drum…. The drum is 32″ in DIAMETER X 18″ tall and has 42 buffaloes on it as a herd type setting going in one direction… It’s funny, I just bought this drum at a business that is going out of business, and when I brought the drum home and beat on it, the drum beater that came with it, broke in half! 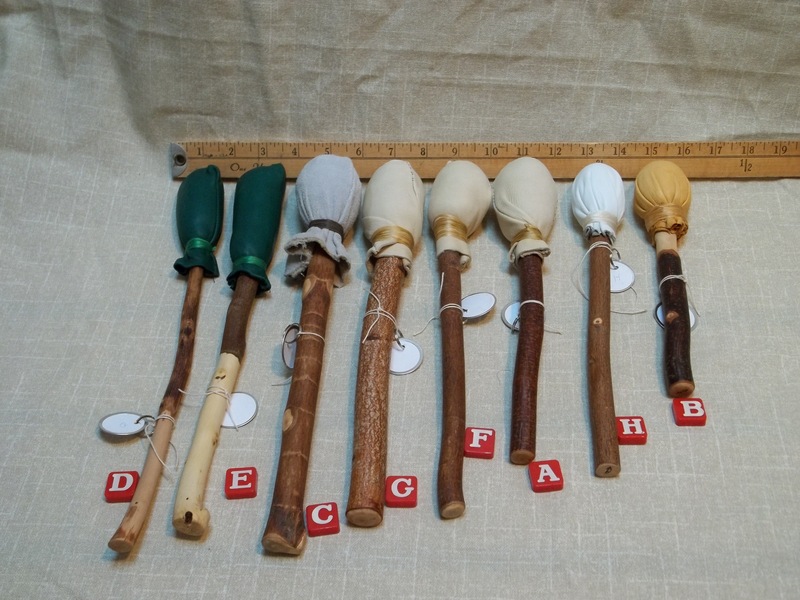 So I am looking for a drum beater that is going to stay in one piece and serve the drum and me well….Your beaters look like that…..
Hello Tinker, I want to thank you so very much for the FANTASTIC DRUM BEATERS you made for me… It makes my drum sound more fantastic than ever! They are truly amazing and using them because they are a gift of creation from you and from Spirit, make using them while drumming, feel and sound great…!!! What a great gift you have and I thank you for sharing that gift with me and creating such natural beauty, with Spirit, that you did for me! They are one of a kind and their fine natural quality, and your craftsmanship are greatly appreciated by me. Many wonderful Blessings to you and thank you again for your Spiritual creations of Love! JoAnna Y.